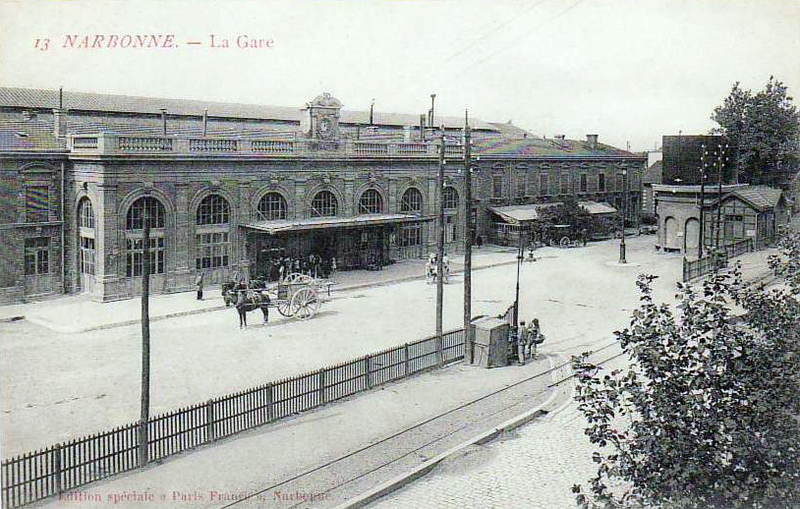 This location was not the only possible point of exchange between the metre-gauge line and the standard gauge line. 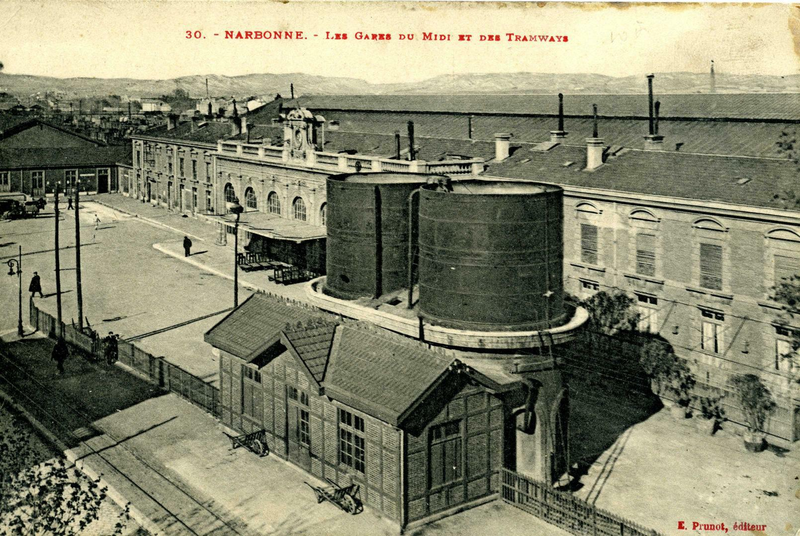 The relative size of the facilities is striking. 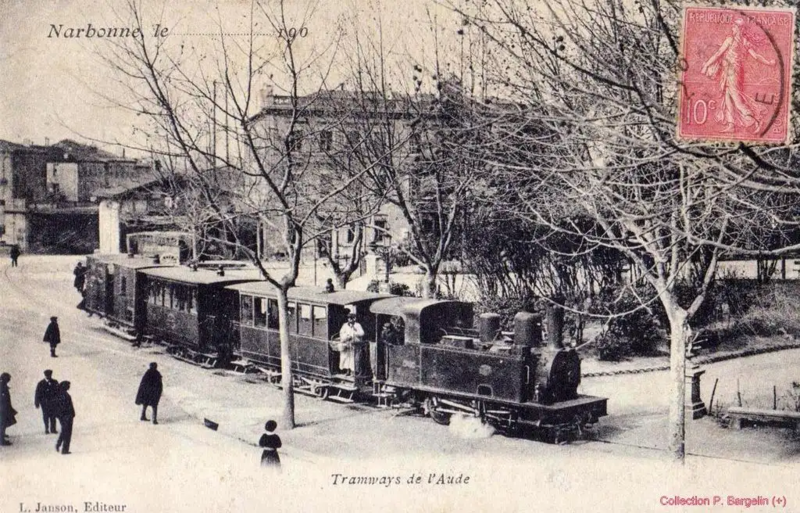 The tramway’s compact facilities kept the tramway overheads low. 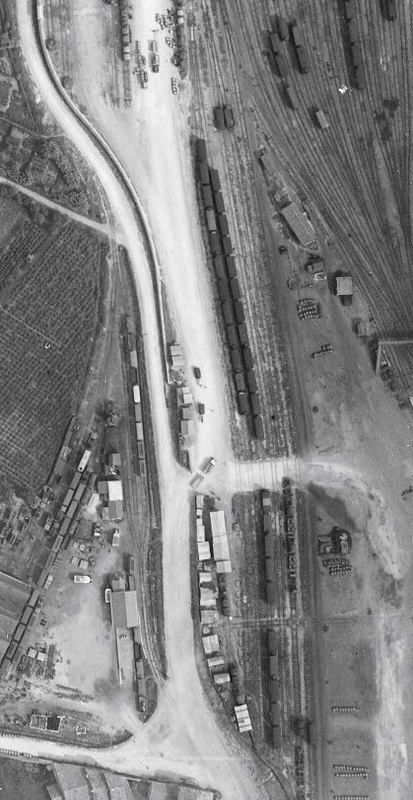 This image is taken from a point on the bottom edge of the aerial image immediately above looking North into the area of the tramway sidings which has now been completely redeveloped. 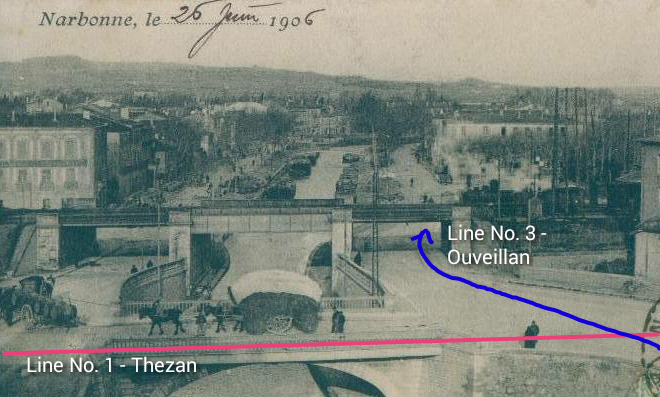 The monochrome images above have been aligned to show the tramway running up and down the photograph. 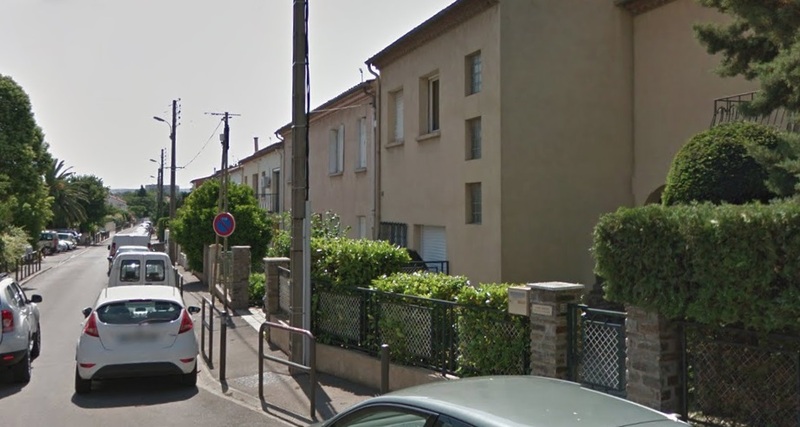 It actually ran in a more northeasterly direction. 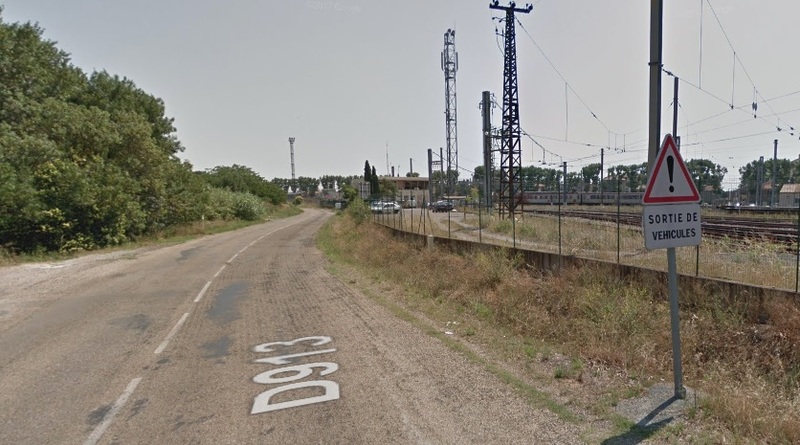 The tramway followed what is now the D913 Rue de Cuxac along the western side of the large standard gauge facilities until it reached a further series of sidings and a transshipment wharf/shed. 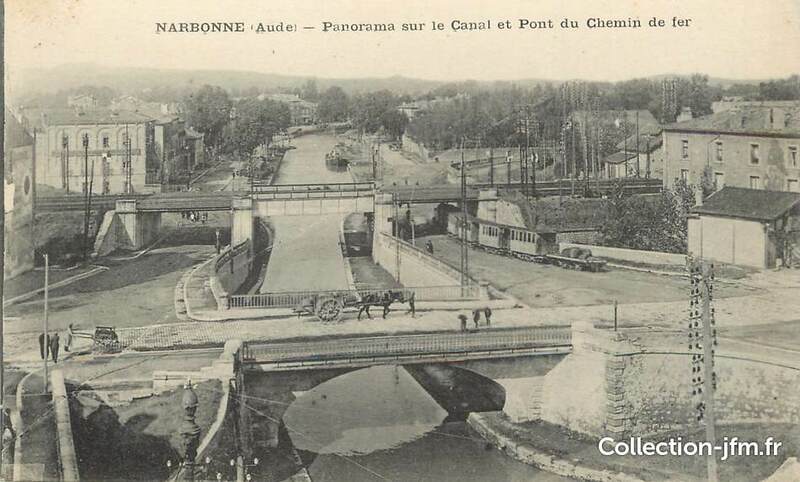 This image from the 1930s shows the main tramway route following the banks of the Canal while a branch runs into the Gare du Midi facilities to the East of the D913, where a transshipment wharf and shed are provided. 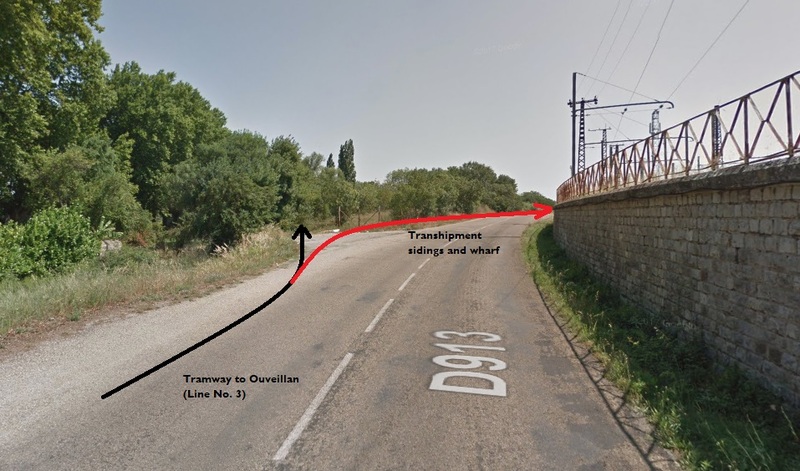 This Google Streetview image shows the line of the tramway to Ouveillan in black and the approximate line of the route into the transshipment yard and wharf in red. 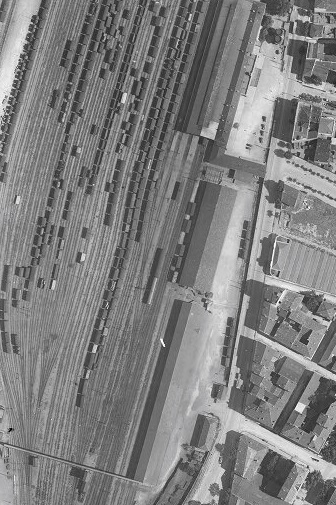 The location of the sidings and transshipment shed/wharf in the early 21st Century. 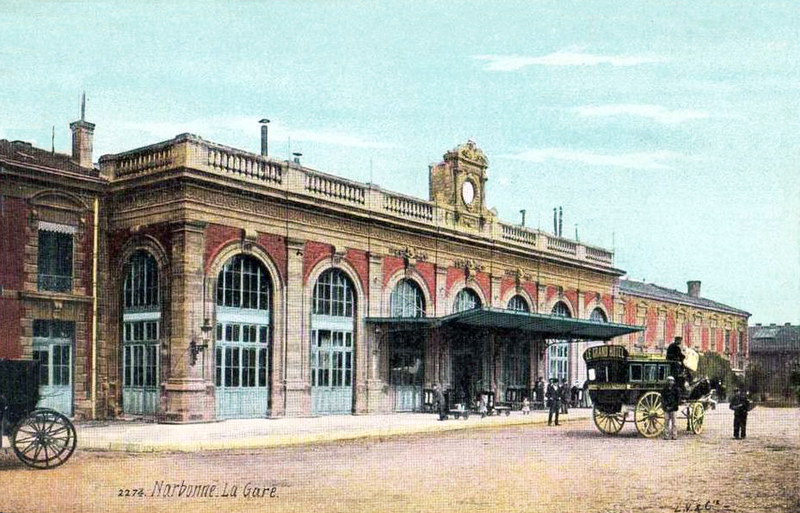 North of the Tramway Station at the Gare du Midi the tramway had further sidings alongside the standard gauge facilities. 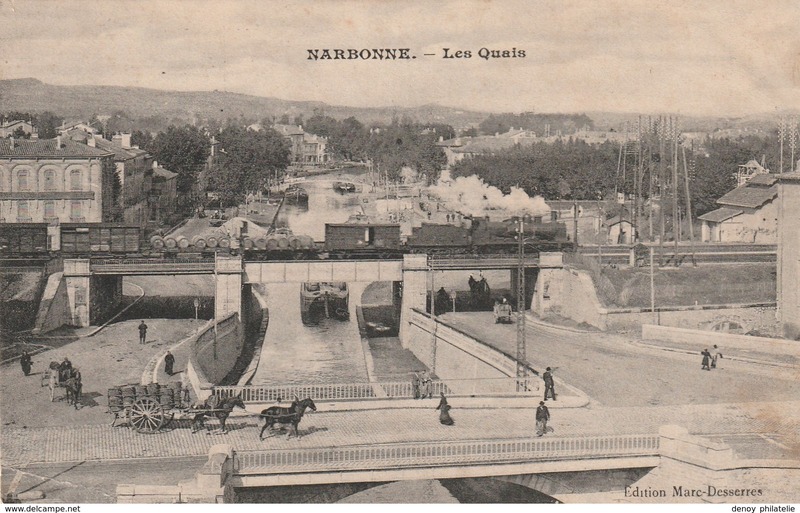 The third line in Narbonne (Line No. 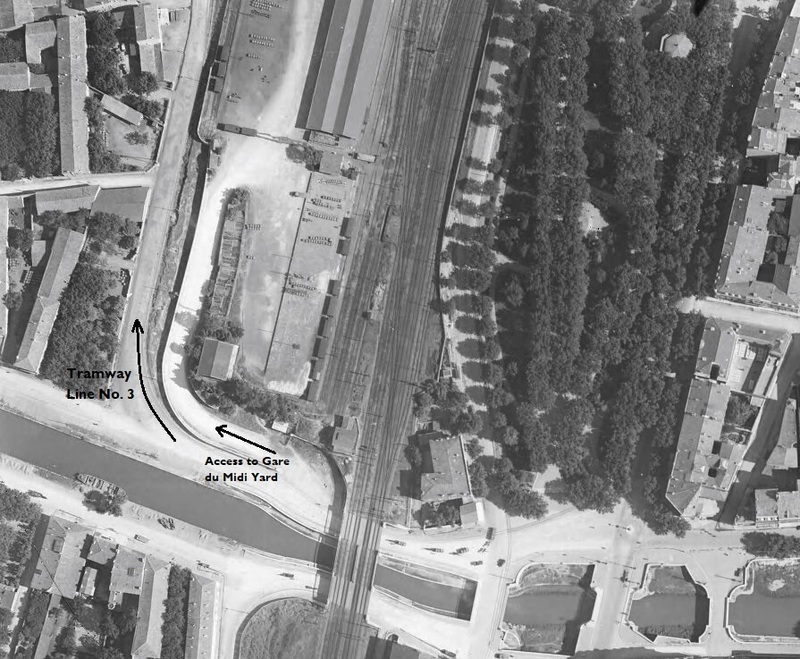 2, on our sketch plan above) set off North from the Station as well. 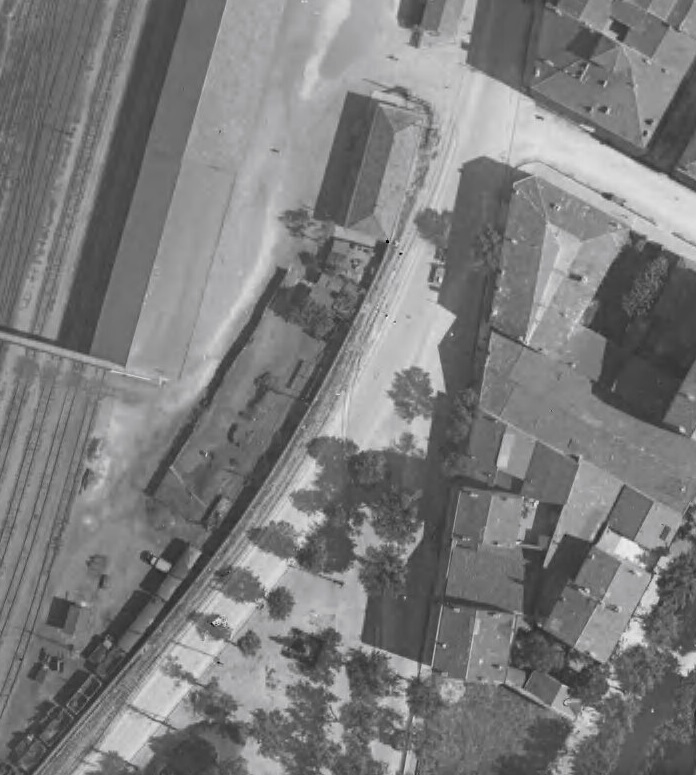 On the adjacent aerial image, again from 1930, the transshipment facilities near the line to Ouveillan can be seen in the top left. 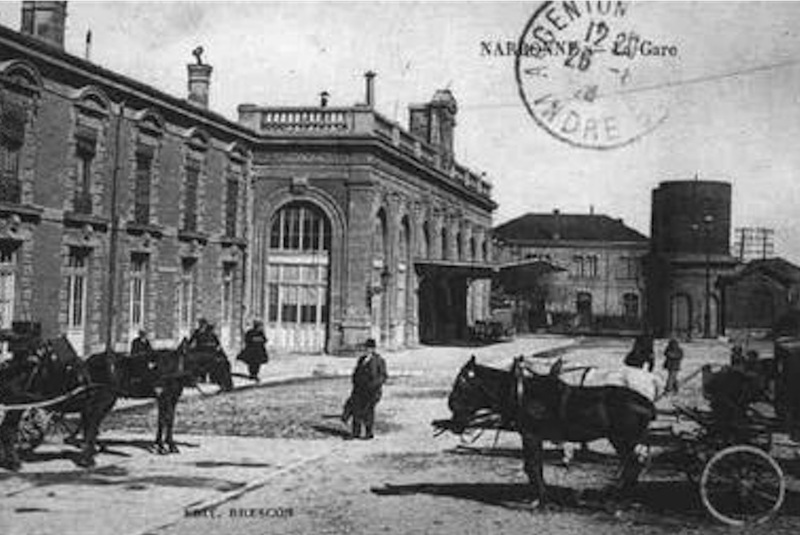 The tramway station building, bottom centre. 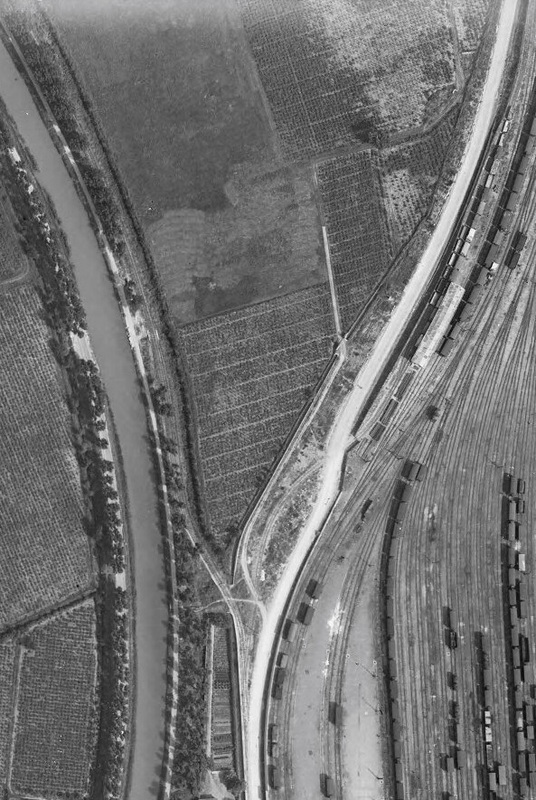 The tramway sidings to the East of the Standard Gauge line can just be picked out at the top right of the picture. 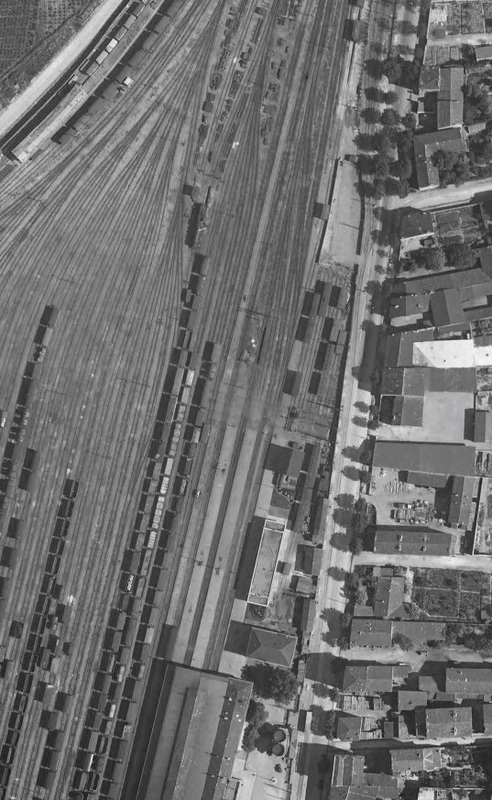 Careful inspection of the image will show the tramway departing to the East from a point where the sidings begin. 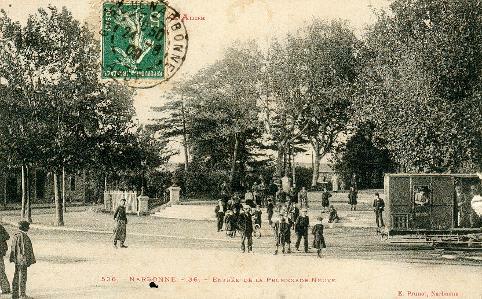 This is shown more clearly below. 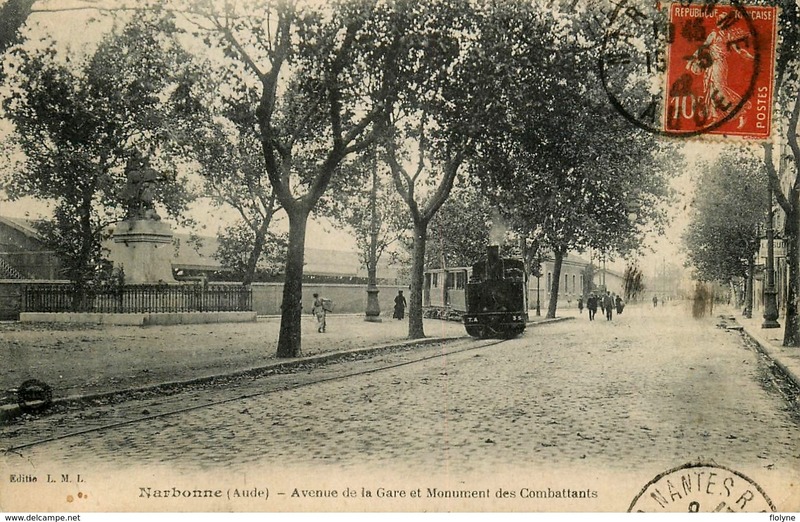 The modern Avenue de Carnot follows the line of the old road and tramway. 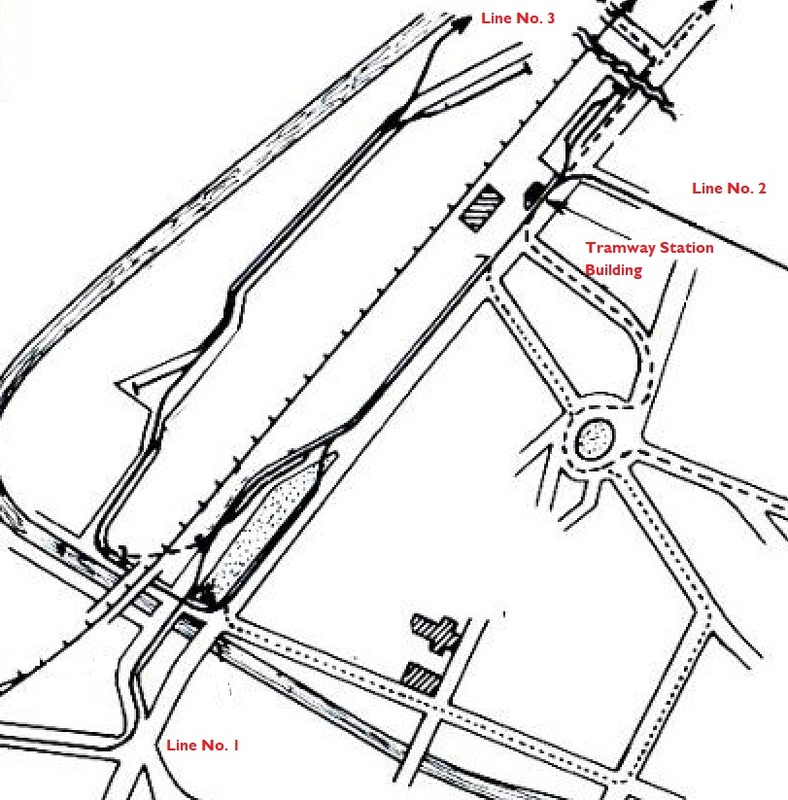 The tramway then turns East as on the aerial images from 1930. 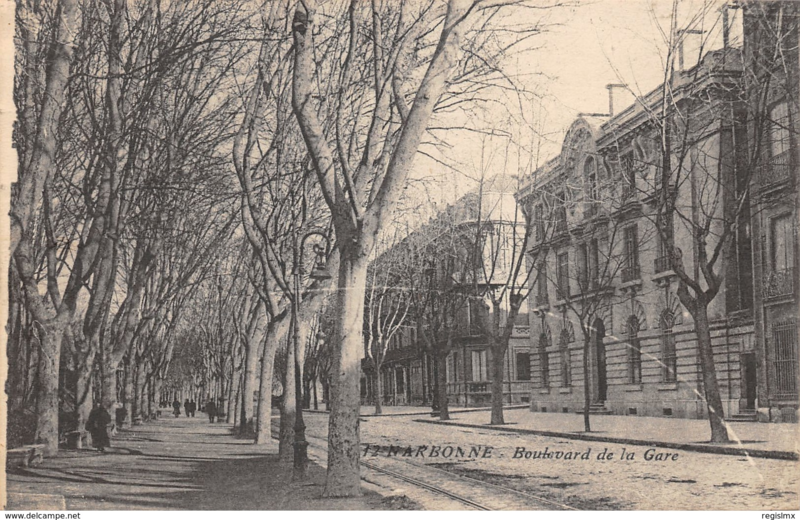 The road is now known as Rue Beaumarchais. 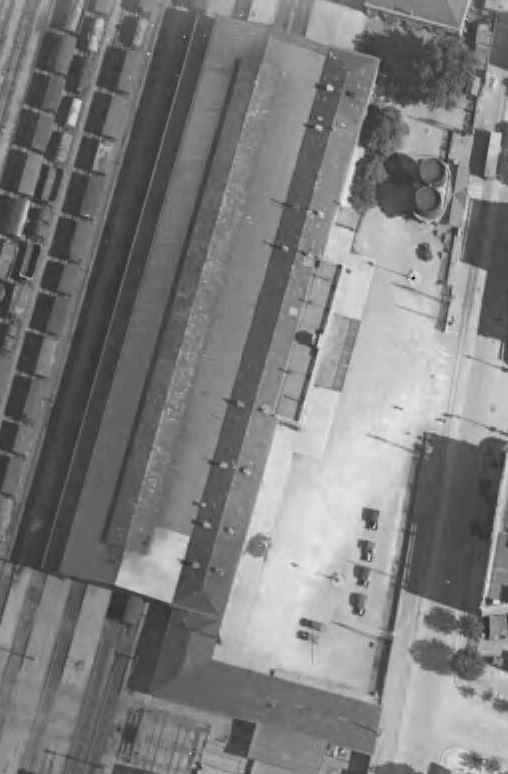 As can be seen on the image immediately above it led to open fields. 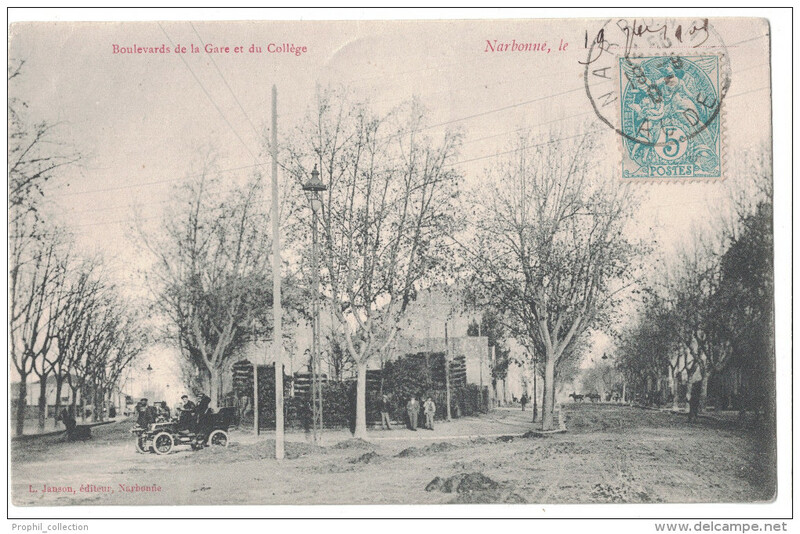 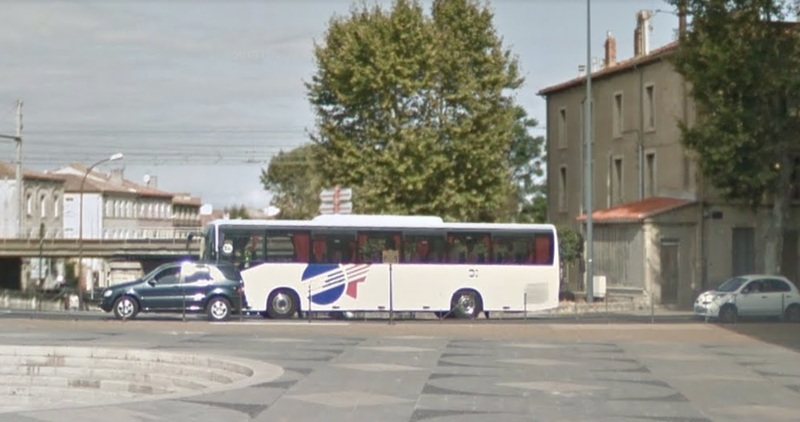 In the early 21st century the are is now part of the suburbs of Narbonne. 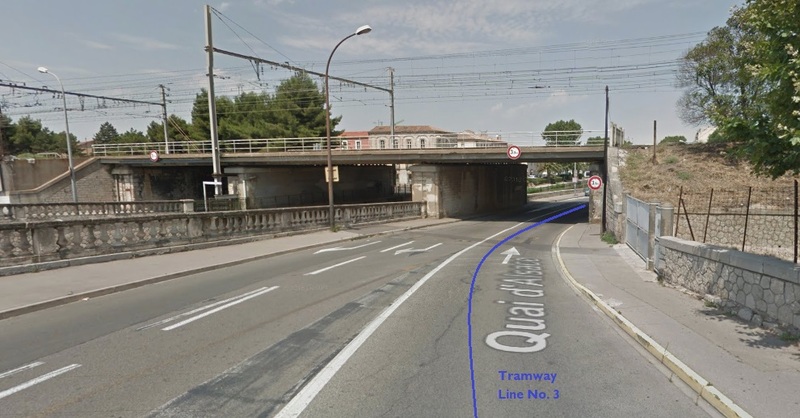 This completes the survey of the tramways in Narbonne. 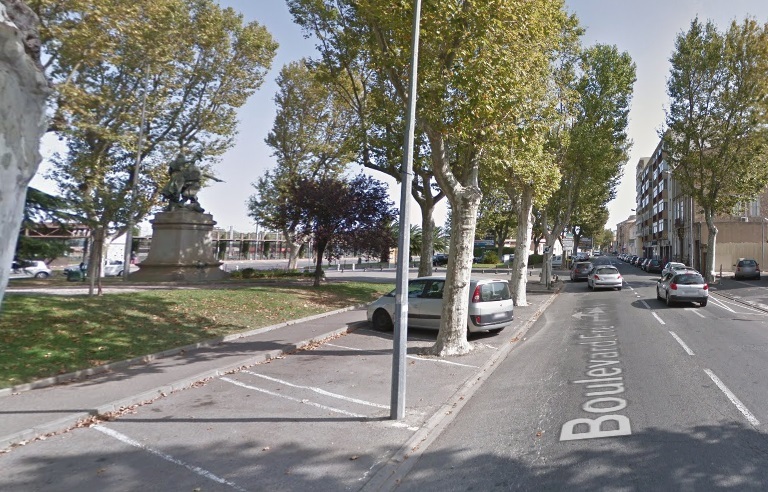 The two routes to Ouveillan and Fleury remain to be covered as they travel North and East out of the city. 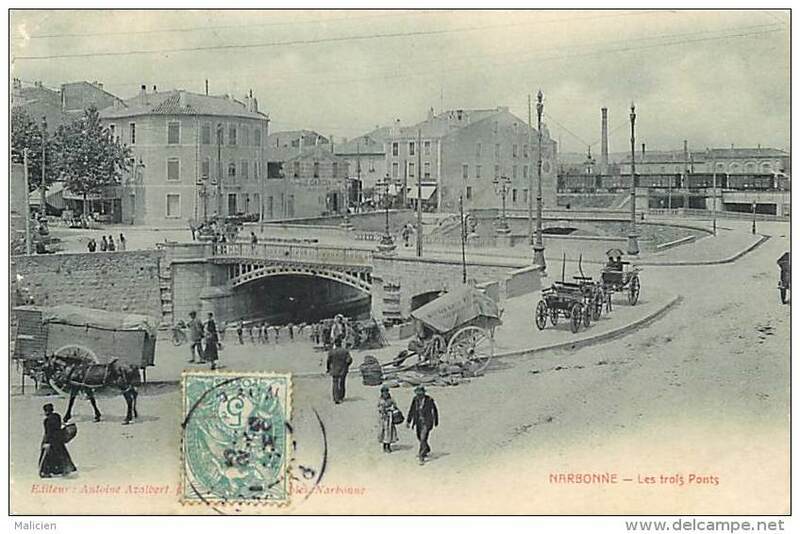 Once those posts are completed our survey of the Tramways de l’Aude will also be complete. 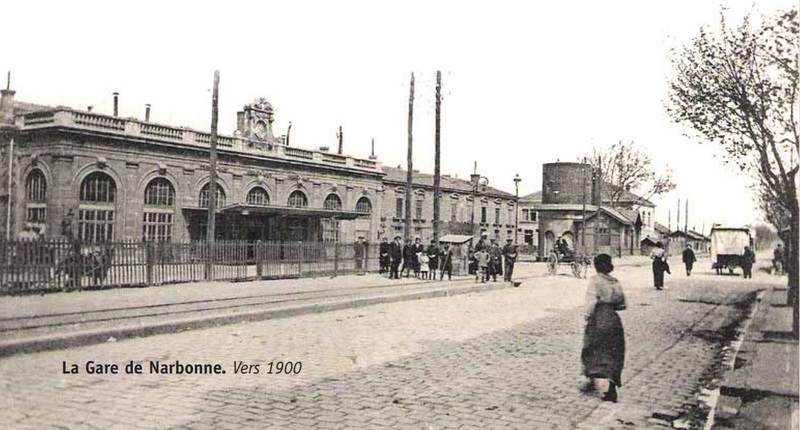 http://www.commune1871.org/bulletins/pdf/Bulletin_40.pdf, accessed on 2nd November 2018.
http://www.trains-de-jardin.net/images/?dossier=Mirliton34/CorbieresAnciens, accessed on 2nd November 2018.
http://transpressnz.blogspot.com/2012/10/gare-d3e-narbonne-france.html, accessed on 2nd November 2018.
https://www.gares-sncf.com/fr/gare/frxna/narbonne, accessed on 2nd November 2018.
https://www.delcampe.net/fr/collections/cartes-postales/france/narbonne/narbonne-faubourgs-du-canal-train-55510337.html, accessed on 2nd November 2018.
https://www.delcampe.net/fr/collections/cartes-postales/france/narbonne/11-narbonne-les-quais-avec-train-sur-le-pont-525985727.html, accessed on 2nd Novembr 2018.
https://www.delcampe.net/fr/collections/cartes-postales/france/narbonne/departs-div-ref-ee90-aude-narbonne-3-ponts-chariot-douillard-gruissan-canal-canaux-train-trains-363690920.html, accessed on 2nd November 2018.
https://www.delcampe.net/fr/collections/cartes-postales/france/narbonne/narbonne-train-locomotive-avenue-de-la-gare-et-monument-des-combattants-chemin-de-fer-belle-animation-453866037.html, accessed on 2nd November 2018.
https://www.delcampe.net/fr/collections/cartes-postales/france/narbonne/narbonne-la-gare-facade-tres-beau-plan-anime-612931234.html, accessed on 2nd November 2018.
https://www.delcampe.net/fr/collections/cartes-postales/france/narbonne/aude-11-narbonne-joli-plan-sur-les-boulevards-de-la-gare-et-du-college-avec-voiture-ancienne-animation-janson-343316390.html, accessed on 2nd November 2018.
https://www.cparama.com/forum/narbonne-t220-20.html, accessed on 2nd November 2018.
http://www.wiki-narbonne.fr/index.php?title=Gare_de_Narbonne, accessed on 3rd November 2018.
https://collection-jfm.fr/t/cartes-postales-anciennes/france/11-aude/narbonne-11, accessed on 4th November 2018.
https://phil1101.skyrock.com, accessed on 7th November 2018.
https://www.geneanet.org/cartes-postales/view/5928211#0, accessed on 7th November 2018.
https://remonterletemps.ign.fr, accessed on 8th November 2018. 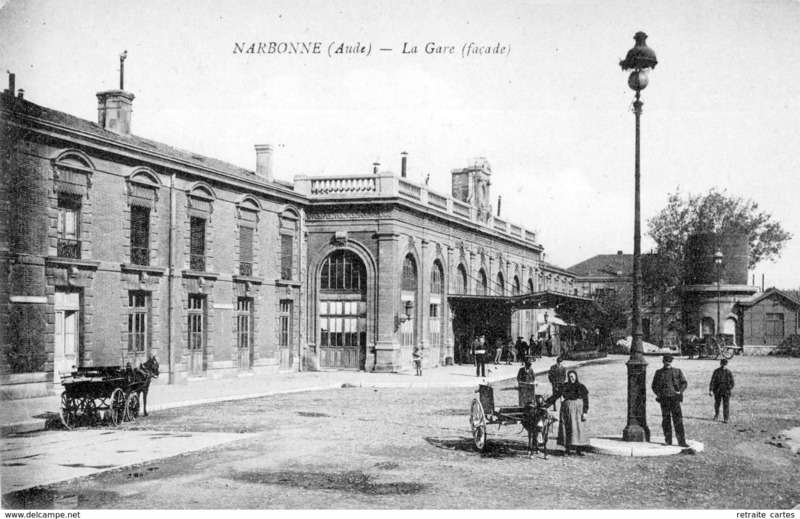 This entry was posted in Railways and Tramways of South-Western France, Railways Blog on November 3, 2018 by rogerfarnworth.